When the 52 playing cards are ordered from Ace of Hearts to King of Spades, they are in the correct position from which to start all forms of divination. The diagram to the left shows the positions of the cards in what is called the sun spread (see The Solar Book). Put 3 cards at a time face down per pile for four piles. Continue this until the last 4 cards are dealt 1 per pile. Stack the 4 piles into 1 pile as follows: Put the 4th pile atop the 3rd pile, atop the 2nd pile, atop the 1st pile. Now deal the cards again--face down--with 1 card per pile for 4 piles. Continue this until all cards are dealt. The deck has now been quadrated, and is ready to be used for divinatory purposes. The next discussion will involve those cards which remain in their positions regardless of how many times the deck is quadrated. The 7 cards that are colored in the spread are called planetary ruler cards. 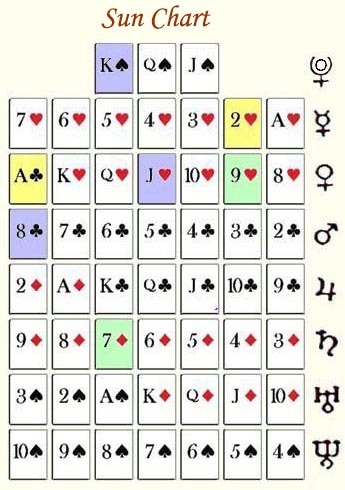 Each of these card are associated with one of the 7 planets, using the natural order for card layout and and the order of the planets in their proximity to the sun. The cards colored violet (in the graphic) are what are called fixed cards. That is, they will always maintain the same position no matter how many times the deck is quadrated. The cards colored yellow and green are fixed also, except that the 2 yellow cards change places each time the deck is quadrated. The same holds true for the green cards. Because those 2 sets of cards change places with each other, they are in what I call a binary state. The remaining cards will all be in different positions--or 'thrown to the wind'--as stated by Richmond. This will be described later in the Karmic Wheel topic. When Richmond would do a reading for a client, he always started by preparing the deck (see the Solar Book) and having the client shuffle it for exactly one minute. Then the client would cut the deck immediately, followed by 2 more cuts occurring precisely at the 20-second interval each. He would use a stopwatch to make sure that the intervals for both the shuffle and cut were maintained. Additionally, he stated that the sun spread--and all of the 90 quadrations--was the result of pure mathematical principles. Richmond called these 90 quadrations "independant solar quadrates", and though devoid of all personal magnetism he considered them worthy of study as an expression of universal law. It is the extension of this belief that forms the basis for this work. In fact, a typical reading will rarely include the individual personal magnetism as described above, but will instead focus on how the cosmic nature of universal law can be seen to interpenetrate the framework of this study. How then do we apply the person's magnetism to the reading without having them perform the shuffle and cut prescribed by Richmond? I believe that overlaying the individual's natal astrology over the Sun Spread, or any other quadratic grand spread, will give us the means by which the person's personal magnetism can be infused into the reading. This means that the natal rising sign will exert a great influence since it is driven by the exact time and location of the individual's moment of birth. In addition to assessing the rising sign, it is important to incorporate the position of the Sun and the Moon into the reading for an individual. Lastly, each of the planets, including their aspects, should be considered when doing a Life Reading for an individual. The fixed and binary state cards described above are considered the planetary rulers for the reading prescribed by Richmond. And since we are basing our work on the Natural Order book, we could say that those cards are the arbitrary planetary rulers for our study.